Atlanta’s Mercedes Benz Stadium will host the 2019 Super Bowl and millions will be watching on CBS Sports. This year’s Super Bowl LIII telecast on CBS will be produced and broadcast into millions of living rooms by employing the usual plethora of traditional live production equipment, along with a few wiz bang additions like 4K UHD and an 8K camera for replays, and specially equipped wireless handheld cameras supporting augmented reality graphics and motion tracking on the field. The network said that 115 cameras would be used, 86 for the main broadcast alone, giving viewers an unprecedented television viewing experience. Even the end zones will be covered like never before. Viewers will see plays from virtually every angle being captured by 25 cameras in each end zone. This includes HD cameras with, six 4K cameras, three goal post cameras shooting the back lines (all with Super SloMo capability) and 14 UHD pylon cameras. While the main game will be captured with Sony HDC-2500 HD cameras. Replays will be shot with 16 Sony HDC-4800 (4K/HD Ultra High Frame Rate/Slow Motion) cameras as well a Panasonic (AK-SHB810) 8K camera that uses a single “organic” film sensor capable of shooting 8K/60p video—with wide dynamic range and global shutter scanning to reduce distortion while maintaining maximum detail and clarity in the moving image. This camera’s OPF/CMOS image sensor combines an organic photosensitive film that sits atop CMOS circuitry. All of these HFR/SloMo cameras will be strategically placed around the stadium to add to the HD broadcast by allowing the crew to shoot a 4K/8K image and then extract an HD (1080p/60) replay in captivating detail. 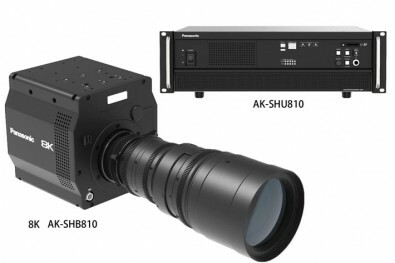 Most of these 4K cameras will include large Fujinon DigiPower (2/3-inch) and smaller handheld HD and 4K lenses. Canon 4K and HD lenses will also be used in some areas of the production. A single Panasonic 8K camera will join a host of 4K cameras that will be used for Super Slow Motion replays, maybe the best-looking images live sports viewers have ever seen. CBS will also use five cameras (including a SkyCam system) to support live augmented reality graphics on the field, plus an additional 10 cameras with trackable first-down-line technology. 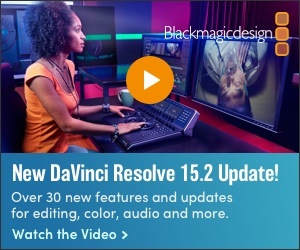 In all, 14 cameras creating virtual graphic elements that are completely computer generated will be seamlessly blended into the main game broadcast. However, when you talk to Jim Rikhoff, Lead Producer for this year’s big game on CBS Sports, he’s more interested in how all of this technology can help tell the story of the game. This will be Rickoff’s seventh Super Bowl, and his first as lead producer (in the last four he served as Replay Producer). To rehearse for the big game, the NFL has hired a local football team, which will come into Benz Stadium in Atlanta on the Friday before Super Bowl Sunday. The crew will test the camera angels and other technology as they follow the players that will be running through a number of plays that most likely will occur in the big game. 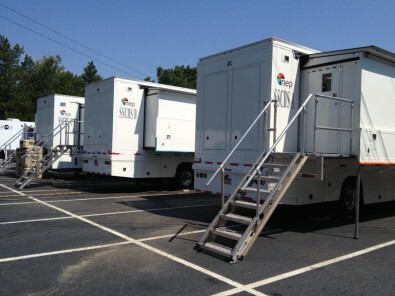 NEP’s SSCBS compound of trucks will be onsite in Atlanta. CBS Sports has used the trucks to televise the past two NFL regular seasons. NEP will supply a total of 11 production trucks in Atlanta, many doing work for other networks as well as domestic and international media outlets. Used by CBS during this year’s NFL regular season, the heart of the Super Bowl broadcast will be NEP Broadcast’s SSCBS mobile unit “compound”, which is actually made up of three double-expanding 53-ft. trailers and a fourth small rig. The ever-popular half-time show will be produced by a separate NEP Denali truck, which will also provide the Super Bowl world feed. The A unit has a 15- x 21-ft. production area and a 15- x 18-ft. graphics area (each with 12 positions) and features a 192-input Grass Valley Kayenne Elite production switcher, a large monitor wall made up of multiple Boland Communications 31x32-inch flat screen displays, a full complement of EVS XT3 (HD) and XT4 (4K) replay devices, and Calrec Audio Apollo and Artemis audio mixing consoles. There’s also an Evertz EXE Series IP routing switcher (576 inputs x 540 outputs) used to distribute signals between the three mobile units. In fact, the on-site units will all feature IP connectivity all the way out to the stadium and back. Dante audio networking is used to deliver uncompressed, multichannel, low-latency audio over a standard Ethernet network. There’s also a RTS Adam Intercom System with 460 ports, which is operated on the onsite network. 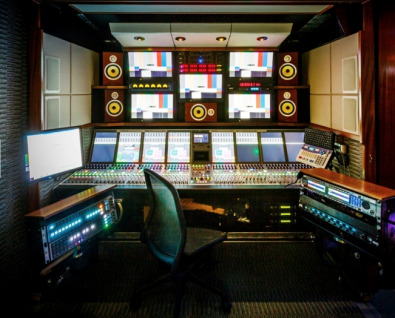 The audio mixing area of the SSCBS A truck features a Dante-networked Calrec Apollo console. Click to enlarge. SSCBS’ B unit houses most of the computer/servers needed to process the graphics and other tasks. Besides the engineering and video area, the B unit also includes the main audio room (measuring 15 x 8 ft.) and the audio submix room (10 x 10 ft.), both with three operator positions. Key equipment in the main audio room is a Calrec Apollo console with 72 faders and Bluefin2 signal processing to provide 1,020 channels. A Calrec Artemis console with Bluefin and 64 faders will be used in the truck’s submix room. The crew will also use Day Sequerra audio processors, Bowers & Wilkins surround-sound speakers and an RTW digital audio scope. A mix of Audio-Technica, Sennheiser, Shure and Sony mics are also being employed. The C unit houses a 15- x 27-ft. replay area with 20 EVS replay operators, with two 12-channel XT3 units, four eight-channel XT3 units, a six-channel XT3 SpotBox, and five XHub3 sharing networks. The C unit also has IP and Cisco connectivity back to the B unit [which houses the EVS XT3 servers] and a ThinkLogical KVM system with 320 ports and support for 6.5 Gbps data throughout. A full complement of Cobalt Digital gear—including up/down/cross conversion, frame syncs, color correctors, multiviewers, MADI embedders/de-embedders, and assorted 3G video DA's, audio DA's, MADI DA's, audio embed and de-embedders—is also on board the compound’s machine room, along with Tektronix SDI and IP signal monitors and AJA Video Systems signal converters. The SSCBS Replay Area inside the C truck includes 20 EVS operators, with two 12-channel XT3 units, four eight-channel XT3 units. Click to enlarge. The SSCBS Replay Area inside the C truck includes 20 EVS operators, with two 12-channel XT3 units, four eight-channel XT3 units, a six-channel XT3 SpotBox, and five XHub3 media sharing network devices—which allow multiple XT3 production and playout servers to be interconnected through a central hub offering the CBS Sports crew a bandwidth of up to 1.5 Gbps. There will also be a 58-foot long, non-expanding D trailer that will be used for overflow EVS operators (as many as 25 operators will work the Super Bowl) as well as additional edit facilities and voiceover requirements. This year marks CBS Sports' 20th Super Bowl telecast in its long and storied history; beginning with the very first Super Bowl I on January 15, 1967 live from Los Angeles, CA where the Green Bay Packers beat the Kansas City Chiefs 35-10. Interestingly, NBC also televised that game live, as they had the exclusive contract for the fledgling AFL while CBS was contracted to produce the NFL’s games.